With March right around the corner, we all know what that means: Founders KBS release. We all anticipate it, we all thoroughly enjoy it, and we all hope to get our hands on some. The rumor has it that this will be released at Founders on Saturday, March 13th. Of course I believe no one unless I here it directly from the source, so I emailed Founders. This is pretty much the entire reponse I received on the topic from Mark Dorich, Director of Retail Operations at Founders Brewing Company. 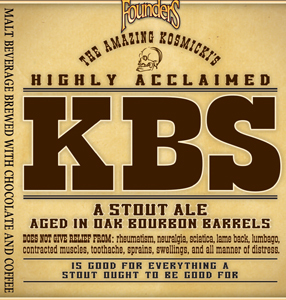 Each year, Founders KBS is released to the marketplace on the Ides of March (15th). nike lebron 11 Here at the brewery, we host a release day on the closest Saturday to the Ides. This year, that magical day falls on March 13th. Beginning when we open at 11am, KBS will be flowing on draft, and KBS Bottles will be available for to-go purchase on a first come – first served basis. There will once again be a limit of 2 cases per person. Later that night, the party starts, where we will be featuring some great live music from Boston’s Rubblebucket Orchestra, and Kalamazoo’s Funktion. Both are phenomenal bands that play a diverse mix of music. A couple of local hotels are offering preferred rated to Founders customers for those who want to stick around and make a night out of it: The Holiday Inn on Pearl St (formerly the Days)(616) 235-xxxx; as well as the Radisson Riverfront on Ann St (616) 363-xxxx. To get the preferred rate, make sure you mention Founders when booking your room! We look forward to enjoying 2010’s batch of KBS with you! Anytime I get this kind of wonderful information from a brewery, I have to offer my kudos for their quick turn around and the useful information. Thank you Mark. Now I just have to convince the wife to allow me to make the trip. Enjoy! This entry was posted on Friday, February 26th, 2010 at 11:57 am	and is filed under Midwest Beer News. You can follow any responses to this entry through the RSS 2.0 feed. Both comments and pings are currently closed.